“That’s not where I saw you, but I bet you’re there too,” he said, a mischievous half smile playing on his lips. “Well?” I prompted when he didn’t elaborate. This book introduces you to Roxanne Fosch who is hiding from those who held her captive at a lab for several years. With “Heir of Ashes”, Jina S. Bazzar presents us with “Heir of Ashes”, the first instalment of “The Roxanne Fosch Files” series. This is the first book in a series, with a complex protagonist on a quest for the truth, while hunted to be brought back to the lab. The story is nicely elaborated, comprises interesting turns, and has a good flow. Jina S. Bazzar introduces each character with care, providing them with sufficient depth for their respective relevance. I was drawn into the story right away – as Roxanne’s invisible friend. I could easily envision the characters and locations – with an amazing colour intensity. I had a great time reading “Heir of Ashes”. I am looking forward to continuing the story. Please note: There is a prequel, “The Curse”, a short read that is well worth reading as well; it provides you with useful details on Roxanne’s search for the truth. This is for you if you like urban fantasy, likeable characters, surprises, and good storytelling. Jina was born and raised in Brazil, where she had a joyful and fulfilling childhood. Soon after she graduated from high school, she was diagnosed with a chronic disease that caused gradual vision loss. She became blind at the age of twenty-three. She has since lived in the United States and Brazil, though currently resides in the Middle East. What about you? What did you think about “Heir of Ashes”? Or – if you did not yet read “Heir of Ashes” – are you now interested in reading it yourself? A tale about a girl with heterochromatic eyes that just wanted to flee to a magical world. Between her and her dream, there are only a rock and seven challenging tasks. “One day, of course, Anamelia fled. Forever. It was such a cold night that dreams froze in the air, the slightest sigh of love was crystallized and the tears became diamond droplets. The snow-covered the streets and souls, although those were happier and able to keep themselves warm. This book introduces you to Anamelia, orphaned young – now trying to realise her dreams at all cost. With Anamelia, Alec Silva has created a bizarre fantasy story. It is an unusual and quite compelling read, drawing you into the world of Anamelia, watching her activities to fulfil her dreams. As stated in the book’s subtitle, Anamelia is to die eventually; it is a book about death, inspired by the works of Tim Burton and Guillermo del Toro – without copying them. Alec Silva paints a clear and somehow disturbing picture of Anamelia’s mind while the story evolves. Anamelia is of sufficient depth, this also applies to the other characters – depending on their relevance. The story has a fairytale character and a good flow. This is a book for you if you like urban fantasy combined with a streak of horror, and if you like the work of Tim Burton or Guillermo del Toro. Escrever é uma forma de aliviar a dor e retardar minha morte. In love with dinosaurs and Greek mythology, began writing for Jurassic Park, but the first book, “Ariane”, written in 2007, did the legend of Eros and psyche. Since then, he has accumulated more than 40 books, dozens of short stories and a thousand poems, most disposable, but that matured as a writer. Published “Zarak, the Monster” in 2011, inaugurating the great autobiographical genre; in 2013, presented “the Creatives”, which resulted in ambitious projects, starting officially what he calls Lordeverso, which already has some works. What about you? What did you think about Anamelia? Or – if you did not yet read Anamelia – are you now interested in reading it yourself? Some women dread the idea of turning into their mothers. For Elise Gardener, that dread has twisted into an all-too-real nightmare. The book introduces you to two young women: Elise who has just lost her mother and Mallory, her best friend. I will not tell you more about the story than shown in the Goodreads plot description. This would spoil the fun of reading this book yourself. With Line of Descent, James Derry has created an entertaining and cleverly elaborated story. Elise is a very interesting character with a gift who wants to live life without being domineered by third parties. She and Mallory are rather likeable, there is depth in their thoughts. 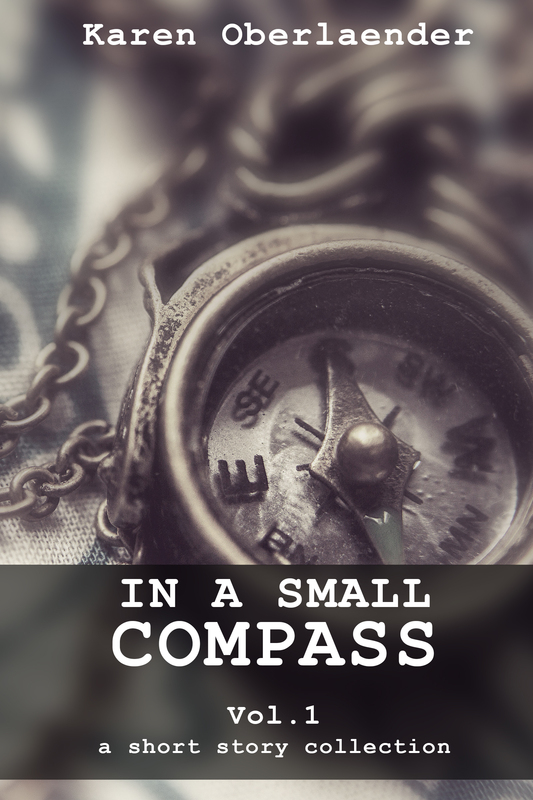 I was drawn into the story right away – as a silent and invisible bystander. The author tells the story in a quite intense way – giving the reader the opportunity to be very close; he handles his characters with empathy. As the story proceeds you learn more about the line of descent – you automatically take sides. This is a book for you if you appreciate a pretty different urban fantasy story, a story providing food for thought. This is a book to read again. Recommended! I’ve been writing or drawing stories since the day my parents let me borrow a ballpoint pen. A few years later I created my first magnum opus in blue ink: a comic-book parody of Ghostbusters called ‘Roastbusters.’ Hey, I was ten. I studied art in college, hoping to become an illustrator. But eventually my aspirations shifted, and I became a graphic designer (living in Atlanta). I returned to writing ten years ago when I met my wife. Since then I’ve spent large chunks of my free time writing (and rewriting) my manuscripts. 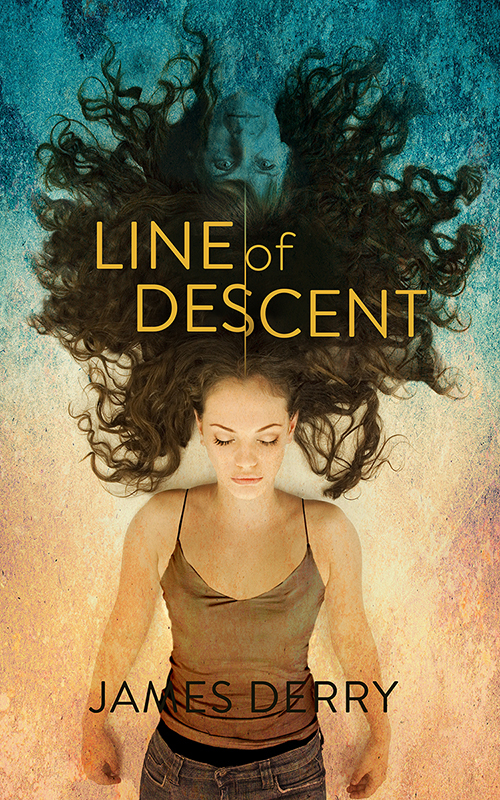 LINE OF DESCENT is the first of my books to see the light of day. I hope to release a Space Western, IDYLL, before mid-year! What about you? What did you think about Line of Descent? Or – if you did not yet read Line of Descent – are you now interested in reading it yourself? If Line of Descent was filmed – who should direct it, who could you imagine as actors? I was concerned by the fact that the Kaiser gang needed guns and handcuffs. The fae – especially elves – can do some wily magic, and handcuffs are about as useful against them as rubber bands. That meant they had been dealing with humans. That’s not unheard of, especially with a bunch like the Kaisers. They go back to the early days of organized crime. The book introduces you to detective Hank Mossberg, located in San Francisco. I will not tell you more about the story than shown in the Goodreads plot description. This would spoil the fun of reading this book yourself. With Murder in the Boughs, Jamie Sedgwick has created an entertaining and cleverly elaborated combination of urban fantasy and mystery. Detective Hank Mossberg is a very likeable character who solves crimes in San Francisco and in the undercity – his customers are humans and fae. I was drawn into the story right away. The author tells Hank’s story in a refreshing way – giving the reader opportunities to get acquainted with the other protagonists as well. As the story proceeds you learn more about Hank’s great personality. This is a book for you if you like magic, mystery and mayhem. This is the first book of a great series. Recommended. I’m married with three children. I live in Northern California surrounded by grapevines and redwood groves. I write mystery, thriller, sci-fi, and fantasy. I enjoy camping, building canoes, making wine, restoring classic cars, blacksmithing, and black powder firearms. What about you? What did you think about Murder in the Boughs? Or – if you did not yet read Murder in the Boughs – are you now interested in reading it yourself? If Murder in the Boughs was filmed – who should direct it, who could you imagine as actors? Leiah Cooper sent me a copy of this book (epub format) on behalf of the author in exchange for an honest review. The world’s not what everyone thinks it is – unless you think that our world’s a pawn in a game of chess between Heaven and Hell, and riddled with as much magic and wonder as it is with evil. This story introduces you to Cèsar. He is an agent with the Office for Preternatural Affairs. He wakes up with a major hangover – and his world is turned upside down. I cannot tell you more about the story as it would spoil the fun of reading it yourself. With Witch Hunt, SM Reine presents us with a fast-paced – part gory, part hilarious – mystery. The story is cleverly elaborated, focuses on Cèsar and his way of solving a crime he did not commit. SM Reine describes her characters with not too many words and still makes you see them clearly before you. I was drawn in, felt like a shadow close to Cèsar and the events. I could easily envision the characters and locations. I had a very good time reading Witch Hunt. I also liked the quite different protagonist’s name; not the usual César or Cesare – Cèsar! 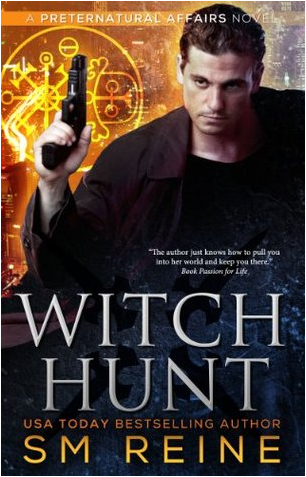 Witch Hunt is well written and – I am really looking forward to reading the next books within The Preternatural Affairs series. What about you? What did you think about Witch Hunt? Or – if you did not yet read Witch Hunt – are you now interested in reading it yourself? If Witch Hunt was filmed – who should direct it, who could you imagine as actors?